Need a special dish on a busy day? 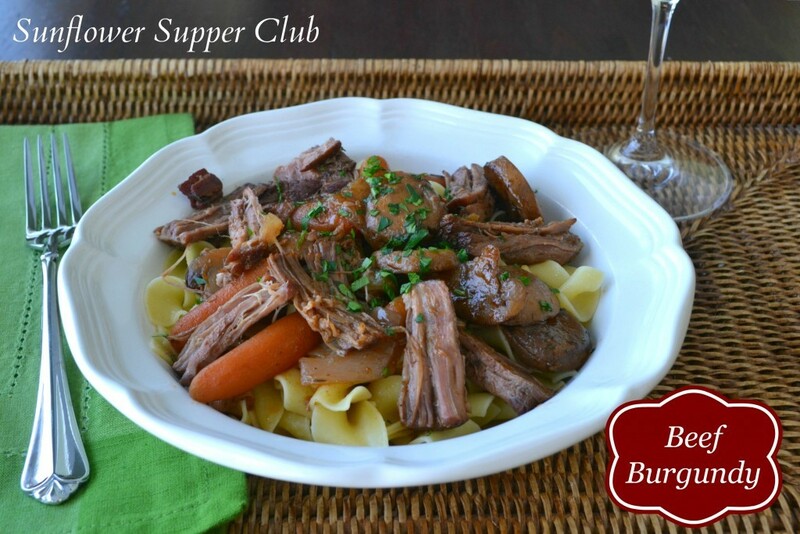 Look no further than this delicious braised beef. This happened to be the first chuck roast I have cooked all winter, which I think is just crazy! I love the way my kitchen smells when this is in the oven. In a large Dutch Oven or heavy pot, heat oil. Brown the bacon over medium heat. When browned, remove with a slotted spoon and set aside on a paper towel lined plate. Add the beef and brown for about 3-4 minutes per side. Remove all but a couple of tablespoons of the oil in the pot. Reduce the heat to medium and add the onion, carrots and mushrooms. Sauté for a few minutes until beginning to color. Add the garlic and tomato paste and cook a couple more minutes. Return the beef to the pot along with any accumulated juices on the plate. Sprinkle the ½ cup flour over the beef and mix to coat the beef and the veggies. Slowly add the beef broth and bring to a simmer. Simmer for 2 minutes, making sure to scrape the bottom of the pan. Get all those glorious browned bits. They will really flavor your dish. Add the wine, Worcestershire sauce, thyme, marjoram, and bay leaf. Make sure that the beef is nestled down into the liquid. Cover and place in the oven and cook for about 2 – 2 ½ hours or until tender. Serve with buttered egg noodles or mashed potatoes. If you prefer your carrots with a little more "crunch", you can add them about an hour before your beef is done. I don't mind them soft. I would rather throw the whole thing in the oven and forget about it.